By Jim Purpura. Posted April 24, 2012, 8:15 PM. 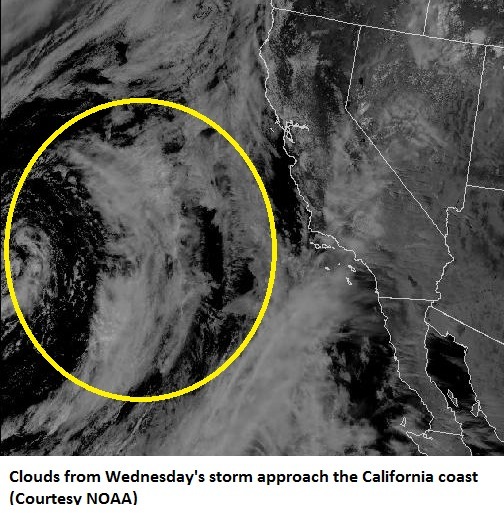 A storm developing over the Pacific is coming our way, and will bring a change to the weather over the next few days. Today's increasing high and middle clouds heralded the approach of the storm. The main part of the storm is still several hundred miles out to sea, but the fetch of tropical moisture will help it rain well before the storm's center reaches the coast. This storm is a bit different than the storms this past winter, since it is one of only a few to have a subtropical tap of moisture. Light showers could begin as early as Wednesday morning, but the main activity will be late afternoon and evening Wednesday as the best storm lift and moisture, combined with adequate instability, will combine to produce elevated thunderstorms which could move onshore from the coast. The heaviest rain will fall in showers and thunderstorms Wednesday night and early Thursday. Clouds will continue with a few showers into the day Thursday. Rainfall amounts will be quite variable in showers and storms, but will generally be from 1/2 to 1 inch total. A few locations should see around 1 1/2 inches of rain in the form of heavy showers and thunderstorms.